نورعلی وند, فاطمه, فرخیان فیروزی, احمد, چرم, مصطفی, کیاست, علیرضا. (1394). مقایسه کارایی نانوذرات آهن صفر ظرفیتی و نانوذرات آهن پایدار شده برای احیای نیترات از آب‌های آلوده. مجله آب و فاضلاب, 26(5), 56-64. 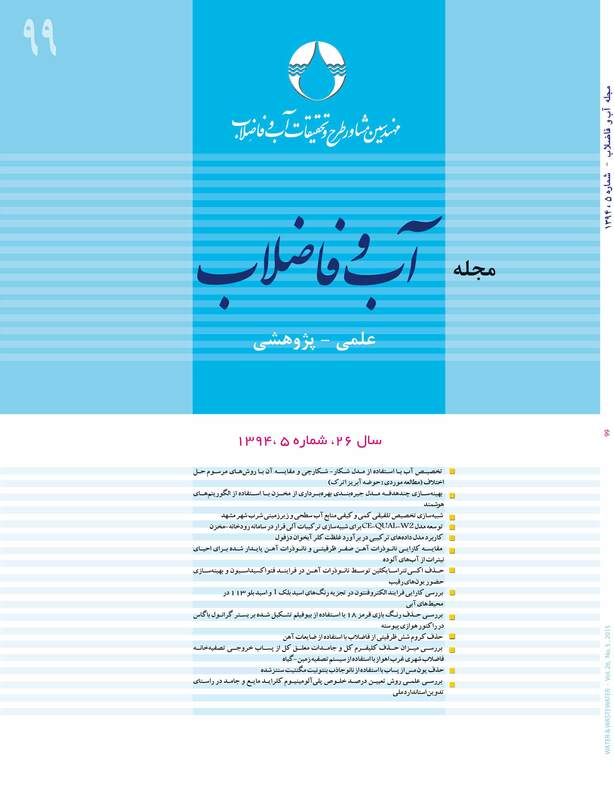 فاطمه نورعلی وند; احمد فرخیان فیروزی; مصطفی چرم; علیرضا کیاست. "مقایسه کارایی نانوذرات آهن صفر ظرفیتی و نانوذرات آهن پایدار شده برای احیای نیترات از آب‌های آلوده". مجله آب و فاضلاب, 26, 5, 1394, 56-64. نورعلی وند, فاطمه, فرخیان فیروزی, احمد, چرم, مصطفی, کیاست, علیرضا. (1394). 'مقایسه کارایی نانوذرات آهن صفر ظرفیتی و نانوذرات آهن پایدار شده برای احیای نیترات از آب‌های آلوده', مجله آب و فاضلاب, 26(5), pp. 56-64. نورعلی وند, فاطمه, فرخیان فیروزی, احمد, چرم, مصطفی, کیاست, علیرضا. مقایسه کارایی نانوذرات آهن صفر ظرفیتی و نانوذرات آهن پایدار شده برای احیای نیترات از آب‌های آلوده. مجله آب و فاضلاب, 1394; 26(5): 56-64. هدفازانجاماینپژوهشامکان‌سنجیکاربردنانوذراتآهنبرایاحیاینیتراتدرمحلول‌هایآبی بود. به این منظور نانوذرات آهن صفرظرفیتی پایدار نشده و نانوذرات پایدار شده با کربوکسی متیل سلولز به‌روش احیا توسط بوروهیدرید سدیم ساخته شد و مورفولوژی آن‌ها به‌وسیله میکروسکوپ الکترونی روبشی، طیف پراش‌نگار اشعه ایکس و دستگاه طیف‌سنج مادون قرمز بررسی شد. تأثیر عوامل مختلف شاملpH محلول آبی، غلظت اولیه نیترات، غلظت نانوذرات و زمان تماس بر احیای نیترات و سینتیک احیای نیترات بررسی شد. نتایج نشان داد که 93 درصد نیترات توسط نانوذرات پایدار شده در pH برابر 6 و 85 درصد توسط نانوذرات پایدار نشده در pH برابر 2 احیاء شد. افزایش غلظت نانوذرات و زمان تماس، احیای نیترات را افزایش داد اما افزایش غلظت اولیه نیترات، احیای نیترات را کاهش داد. محصول عمده احیای نیترات در pHهای اسیدی، آمونیوم بود اما در pHهای قلیایی نیترات به نیتروژن تبدیل شد و مقدار نیتریت تولیدی کمتر از 2 درصد بود. آزمایش‌های سینتیک نشان داد که احیای نیترات با نانوذرات از معادله درجه اول و دوم تبعیت می‌کند. نتایج این پژوهش نشان داد که نانوذرات آهن صفرظرفیتی پایدار شده نسبت به پایدار نشده توانایی بالایی در احیای نیترات آب‌های آلوده دارند. The present study was conducted to evaluate the feasibility of zero-valent iron nanoparticles (ZVIN) for the removal of nitrate from aqueous solutions. For this purpose, bare zero-valent iron nanoparticles (bare-ZVIN) and CMC-ZVIN were synthesized using the borohydride reduction method and their morphological characteristics were examined via scanning electron microscopy (SEM), X-ray diffraction (XRD), and Fourier Transmission Infrared Spectroscopy (FTIR). The effects of pH of the aqueous solution, initial nitrate concentration, ZVIN concentration, and contact time on nitrate reduction were investigated as operational parameters and the kinetics of nitrate reduction was studied in batch experiments. The results showed that 93.65% of nitrate was removed by stabilized nanoparticles at pH=6 while non-stabilized nanoparticles at pH=2 were able to remove 85.55% of the nitrate.Furthermore, nitrate reduction was enhanced by increasing ZVIN concentration and contact time while it was decreased as a result of increasing initial nitrate concentration. The major product of nitrate reduction at an acidic pH was found to be ammonium; at an alkaline pH, however, nitrate was converted to nitrogen and nitrite production dropped to less than 2%. Kinetic analysis demonstrated that denitrification of nitrate by the nanoparticles fitted well with first-order and second-order reaction models. The results also demonstrated that the stabilized ZVI nanoparticles were more effective than bare-ZVIN for nitrate reduction in aqueous solutions. 1. Mashayekhi, S., and Lashkari, A.A. (2011). “Comparative study of the use of urea fertilizer in agriculture and developed countries”. The 1st Iranian Fertilizer Challenges Congress (Half a Century of the Fertilizer Consumption) , Tehran. 2. Bouwer, H. (1989). “Agricultural contamination: Problems and solutions.” Water Environment and Technology, 10, 292-297. 5. Clifford, D.A., and Liu, X. (1993). “Biological denitrification of spent regenerant brine using a sequencing batch reactor.” Water Research, 27(9), 1477-1484. 6. Hono, K., Ping, D.H., Ohnuma, M., and Onodera, H. (1999). “Cu clustering and Si partitioning in the early crystallization stage of an Fe73.5Si13.5B9Nb3Cu1 amorphous alloy.” Acta Mater, 47(3), 997-1006. 7. Liou, Y. H., Lo, S.L., Lin, C.J., and Kuan, W.H. (2007). “Size effect in reactivity of copper nanoparticles to carbon tetrachloride degradation.” Water Research, 41(8), 1705-1712. 8. Petosa, A.R., Jaisi, D.P., Quevedo, I.R., Elimelech, M., and Tufenkji, N. (2010). “Aggregation and deposition of engineered nanomaterials in aquatic environments: Role of physicochemical interactions.” Environmental Science and Technology, 44(17), 6532-6549. 9. Nuhogl, A., Pekdemir, T., Yildiz, E., Keskinler, B., and Akay, G. (2002). “Drinking water denitrification by a membrane bio-reactor.” Water Research, 36(5), 1155-1166. 10. Huber, D.L. ( 2005). “Synthesis, properties and applications of iron nanoparticles.” Small Review, 1(5), 482-501. 11. Yang, G.C.C., and Lee, H.L. (2005). “Chemical reduction of nitrate by nanosized iron: Kinetics and pathways.” Water Research, 39(5), 884-894. 12. Choe, S., Liljestrand, H.M., and Khim, J. (2004). “Nitrate reduction by zero-valent iron under different pH regimes.” Applied Geochemistry, 19(3), 335-342. 13. Zhang, J., Haoa, Z., Zhang, Z., Yang,Y., and Xu, X. (2010). “Kinetics of nitrate reductive denitrification by nanoscale zero-valent iron.” Process Safety and Environmental Protection, 88(6), 439-445. 14. Xiong, Z., Zhao, D., and Pan, G. (2009). “Rapid and controlled transformation of nitrate in water and brine by stabilized iron nanoparticles.” J. Nanopart Research, 11(4), 807-819. 15. Peel, J.W., Reddy, K.J., Sullivan, B.P., and Bowen, J.M. (2003). “Electrocatalytic reduction of nitrate in water.” Water Research, 37(10), 2512-2519. 16. Kim, J., and Benjamin, M.M. (2004). “Modeling a novel ion exchange process for arsenic and nitrate removal.” Water Research, 38(8), 2053-2062. 17. Lin, C. J., Lo, S.L., and Liou, Y.H. (2005). “Degradation of aqueous carbon tetrachloride by nanoscale zerovalent copper on a cation resin.” Chemosphere, 59(9), 1299-1307. 18. Rautenbach, R., Kopp, W., Hellekes, R., Teter, R., and Van Opbergen, G. (1986). “Separation of nitrate from well water by membrane processes (reverse osmosis/elecrodialysis reversal).” Aqua, 5, 279-282. 19. Wang, Q., Qian, H., Yang, Y., Zhang, Z., Naman, C., and Xu, X. (2010). “Reduction of hexavalent chromium by carboxymethyl cellulose-stabilized zero-valent iron nanoparticles.” J. of Contaminant Hydrology, 114(1-4), 35-42. 20. Uzum, S. T., Erog˘lu, T.E., Hallam, K.R., Scott, T.B., and Lieberwirth, I. (2008). “Synthesis and characterization of kaolinite-supported zero-valent iron nanoparticles and their applicationfor the removal of aqueous Cu 2+ and Co2+ ions.” Clay Science, 43(2), 172-181. 21. Cirtiu, C.M., Raychoudhury, T., Ghoshal, S., and Moores, A. (2011). “Systematic comparison of the size, surface characteristics and colloidal stability of zero valent iron nanoparticles pre- and post-grafted with common polymers.” Colloids and Surfaces A: Physicochem. Engineering. Aspects, 390(1-3), 95-104. 22. He, F., and Zhao, D. (2007). “Manipulating the size and dispersibility of zero-valent iron nanoparticles by use of carboxymethyl cellulose stabilizers.” Environmental Science Technology, 41(17), 6216-6221. 23. Fersinius (2001). Water analysis, Translate by Taghavi, A., Volume, 1st Ed., Arak University Press, Arak. 24. Page, A.L., Miller, R.H., and Keeney, D.R. (1982). Methods of soil analysis. part: 2, chemical and microbiological properties, 2nd Ed., America Society of Agronomy, Soil Scinety of America Publisher, Madison, Wisconsin, USA. 25. Zhang, X., Lin, S., Chen, Z., Megharaj, M., and Naidu, R. (2011). “Kaolinite-supported nanoscale zero-valent iron for removal of Pb2D from aqueous solution: Reactivity, characterization and mechanism.” Water Research, 45(11), 3481-3488. 26. Kanel, S.R., Manning, B., Charlet, L., and Choi, H. (2005). “Removal of arsenic (III) from groundwater by nanoscale zerovalent iron.” Environmental Science and Technology, 39(5), 1291-1298. 27. Lin, Y.H., Tseng, H.H., Wey, M.Y., and Lin, M.D. (2010). “Characteristics of two types of stabilized nano zero-valent iron and transport in porous media.” Science of the Total Environment, 408(10), 2260-2267. 28. Choe, S., Chang, Y.Y., Hwang, K.Y., and Khim, J. (2000). “Kinetics of reductive dentrification by nanoscale zero-valent iron.” Chemosphere, 41(8), 1307-1311. 29. Ruangchainikom, C., Liao, C. H., Jin, A. T., and Lee, M. T. (2006). “Effects of water characteristics on nitrate reduction by the Fe-0/CO2 process.” Chemosphere, 63(2), 335-343. 30. Hwang, Y-H., Kim, D-G., and Shin, H-S. (2011). “Mechanism study of nitrate reduction by nano zero valent iron.” J. of Hazardous Materials, 185(2-3), 1513-1521. 31. Ginner, J.L., Alvarez, P.J.J., Smith, Sh. L., and Scherer, M.M. (2004). “Nitrate and nitrite reduction by Feo: Influence of mass transport, temperature, and denitrifying microbes.” Environmental Engineering Science, 21(2), 219-229. 32. Choi, J., Batchelor, B., Wonc, Ch., and Chung, J. (2011). “Nitrate reduction by green rusts modified with trace metals.” Chemosphere, 86(8), 860-865.